As founder of an on-demand makeup team, I often find myself in admiration of various femtrepreneur makeup artists who turn their passion into a wildly successful business. 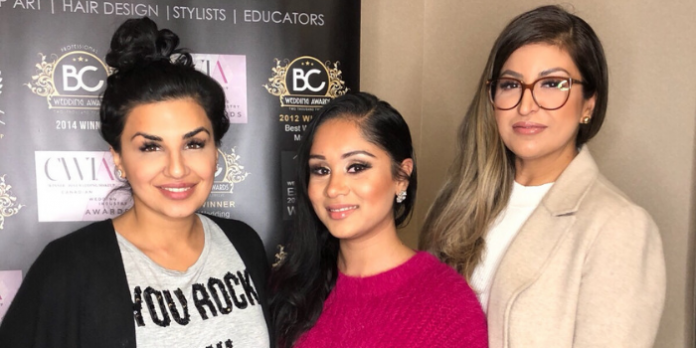 Always looking to perfect and hone my craft I was pleasantly surprised to stumble upon the work of master stylists Harp Sohal and Shannon Mann of the prestigious Pink Orchid Studio. Being a visual person, POS has an eye-catching Instagram for both brides-to-be and fellow artists like myself. To excel in any career, it’s imperative that you learn or seek wisdom from the leading achievers in your desired industry. So, with a thirst for knowledge, the student in me found herself in a Vancouver cab heading over to the POS studio for a one-on-one class with one of the world’s most glamorous CEOs. Enter Shannon Mann. Runway tall, elegant and graceful all came to mind when I think of Mann. She exudes a warm ease paired with feminine energy that is often lacking with male CEOs and the cold culture of the oftentimes male-dominated world of corporate world. My mind raced with questions about technique and business as I stood in the presence of the woman half responsible for building one the most successful Indian and all-woman run beauty empires in North America. Polished and pretty, she is far beyond glamour. 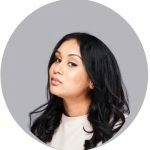 Under all she is equipped with the skill of a modern-day millennial marketing exec, social media guru, educator, and uber-skilled master stylist. My one-on-one class left me far beyond styling bombshell Hollywood waves, POS style. I left filled to the brim with knowledge, inspiration and most importantly a longing to share with my fellow sisters how they too can become wildly successful and ride the waves of entrepreneurism. Let’s start with a fun and frequently asked question. What is the inspiration behind the name Pink Orchid Studio? Many women gawk at Pink Orchid’s gorgeous Instagram feed. How have you built your social media following? Your Instagram has a whopping 144,000 followers and counting. Any specific tips on how entrepreneurs/artists can grow their social media tribe? Many women entrepreneurs and artists look up to you and Pink Orchid’s success. What would you say are the most important factors in creating the right brand for your target audience? Being self-employed or in business for yourself can be a roller coaster. For women out there who are starting out as makeup artists or building a brand what advice can you give about weathering the lows and highs of running your own business? Many people start a brand or business but find themselves fading out of it or not being consistent. How have you stayed driven over the years and not lost motivation or faith in making Pink Orchid what it is today? Are there any artists or business women that you look up to? If so, who and why? Unfortunately, there’s the age-old stereotype of catty behavior amongst women? In your opinion, what can we as women do to stand more united and support each other as artists in the same industry? Another fun question: How did pink orchid get started? Lastly, is there anything you would like to say to POS lovers? Previous articleSuicide in South Asian Cinema: Romanticized or Reality?